Build a Home. Build a Community. At Habitat for Humanity Greater Vancouver we’ve seen how the gift of a home builds a better community, for generations to come. Join us as a RUN4HOPE charity runner and help us build homes so we can give more families a ‘hand up’ out of poverty. Families like the Soomros, Van Essens and Fedoraks. “On behalf of myself and my family, I wish to express our thanks to Habitat for Humanity, volunteers, sponsors and all those who directly or indirectly contributed to this project. Without them, our dream of having a roof over us would have been just that – a dream. Our belief in the goodness of humanity has been enhanced by everyone involved.” Nawaz Soomro, Habitat Partner Family. “My daughter was doing re-bar with me. She was in high-school and here she was on her days off and weekends to help her mom build a house. It was incredible. It really brought our family together in a big way. It made really big changes in our home life. We’ve all become closer as a family because of it.” Margaret Van Essen, Habitat Partner Family. 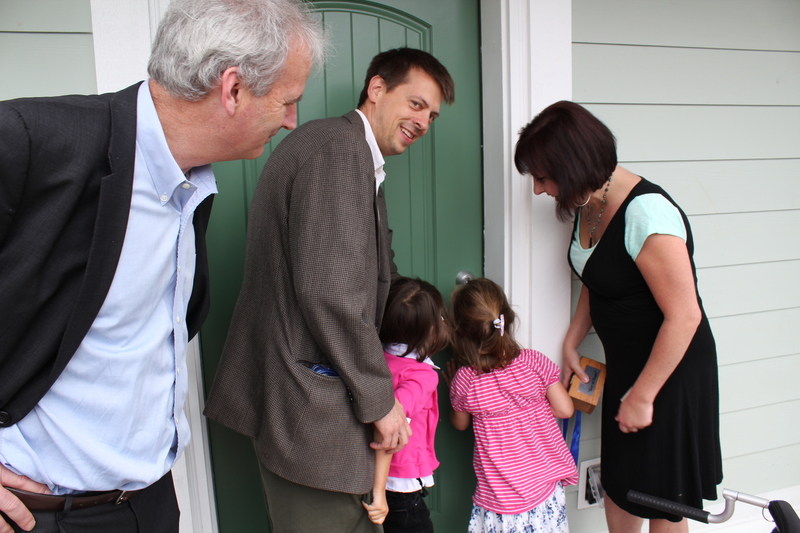 “The children at Government Street’s Habitat community are most definitely the integral driving force of what it means to be part of a community. The children are the heart and soul here. We have had so many get-togethers, birthday parties (kids, and adults alike). A real sense of belonging and community happens here. We feel safe. Our children, and we as parents, feel so happy and safe. We watch out for one another, and most importantly, we watch out for one another’s children. Home. We are absolutely home.” Lisa Fedorak, Habitat Partner Family. Habitat for Humanity believes everyone deserves a safe and decent place to live. In reality, nearly 20% of children are raised in poverty in British Columbia. For single mother families in BC, 50% are struggling to decide between groceries and heat. BC is by far the worst province for the number of children living in poverty, 6% higher than the national average and more than half of those children are living in Greater Vancouver. Habitat for Humanity gives a ‘hand up’ to families who are working hard but aren’t able to make enough to cover the basic living costs, and are forced to live in undesirable and unsafe accommodations for their family. There is a solution – and you can help. With the support of the community, Habitat builds safe and decent homes and provides no-interest mortgages with payments indexed to 30% of the household income, families can live safely, start to build equity and save for a better future. Build. Volunteer. Donate. Shop. Run for Habitat for Humanity Greater Vancouver. Become a Habitat for Humanity Greater Vancouver Charity Runner. Don’t focus on a time. When running your 1st marathon, or race of any length, focus on finishing, not the time it takes you. Train hard & smart. Think speed training, tempo training and long slow distance training, it will give you a big advantage on race day. Fuel for you. Think pre, during and post-race nutrition. Experiment beforehand and find out what works for you. Pace yourself! Try not to let the excitement of the start & participants get you carried away. Understand the distance you are travelling and pace yourself accordingly. Break the run down into sections. Think thirds & quarters to remove the monotony and provide yourself with positive mental checks. Take the challenge and register today to be a Habitat Charity Runner. Help build homes and hope in your community. Register to be a HFHGV charity runner here Run & Fundraise For Us Charity runners will be contacted by HFHGV with fundraising details soon after registration. Habitat for Humanity mobilizes volunteers and community partners in building affordable housing and promoting home ownership opportunities as a means to breaking the cycle of poverty. Habitat homes are sold to partner families with interest-free mortgages, indexed to be no more than 30% of their household income. Families no longer have to make the choice between paying the hydro bill and buying food. Habitat for Humanity re-invests the partner family’s mortgage payments into a Habitat Build Fund to build more homes for families in need. Protected buy backs also allows for the positive cycle to continue; all equity payments made by the family are returned to assist with their next home purchase in the traditional market and allow a new partner family the opportunity to own an affordable home through Habitat for Humanity.